We go hands on with the new Pentax K-01 - the latest mirrorless camera from Pentax, designed by Marc Newson and give our initial impressions. The new Pentax K-01 is a brand new mirrorless camera from Pentax, featuring a 16 megapixel APS-C CMOS sensor and K mount allowing you to use any K mount lens from Pentax. The camera is due to be available to buy in mid to end March, for £629 body only, or £679 with the new compact f/2.8 40mm lens shown. There are plans to offer the K-01 with an 18-55mm kit lens, as well as a 55-200mm zoom lens. 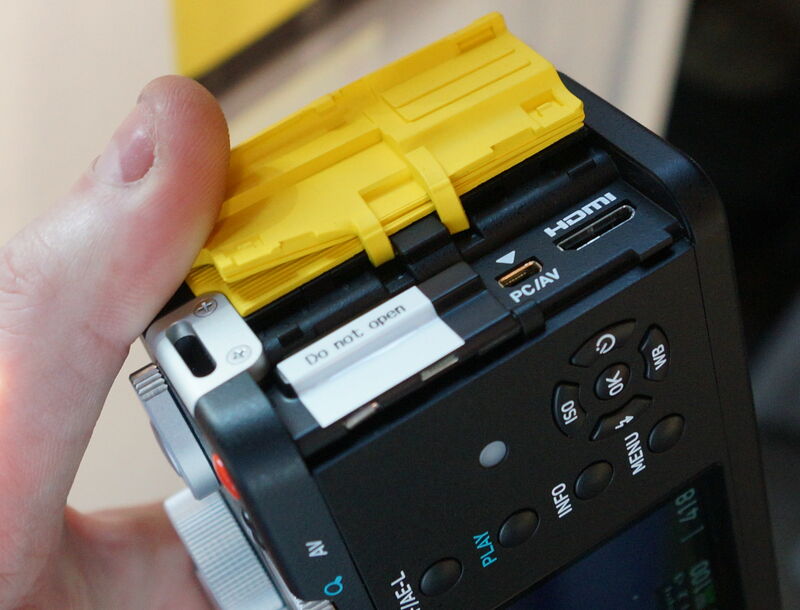 The Pentax K-01 features a 16.1 megapixel APS-C CMOS sensor, 6 fps shooting, Full HD video with 30/25/24fps, a microphone socket, HDMI out and a colourful design that will be available in yellow and black, black and silver, or silver. With a white version available in certain markets. The new 40mm lens is said to be the World's smallest interchangeable lens available. The camera is surrounded by a rubber grip, apart from the back which is mostly black, or silver on the silver model and there is not a traditional thumb grip on the back of the camera. The memory and IO ports (AV/HDMI) are covered by a rubber cover, and on the very left of the camera (looking from the back) there is a microphone socket for video recording. Memory card slot under "Do not open" sticker. The two red and green buttons on the top can be customised, with the red button defaulting to record video in any mode. 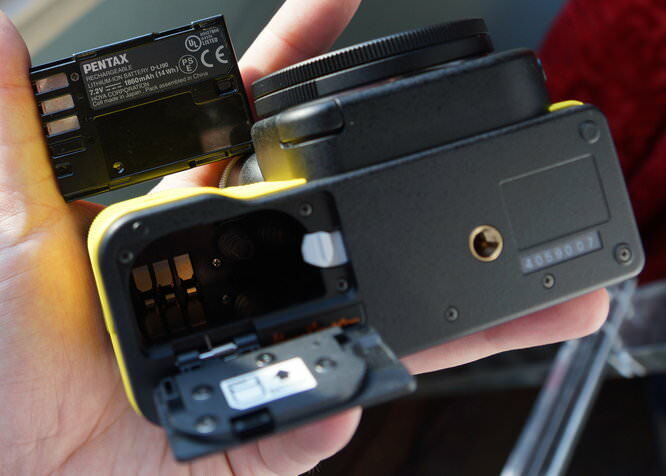 The battery is a large Digital SLR sized battery with a rating of 1860mAh, so should offer good battery life. The camera does not feature and electronic viewfinder, but could support an optical viewfinder in the flash hot shoe. The cameras screen is used for live view and focusing appeared reasonably quick, although not as quick as the quickest mirrorless cameras available. 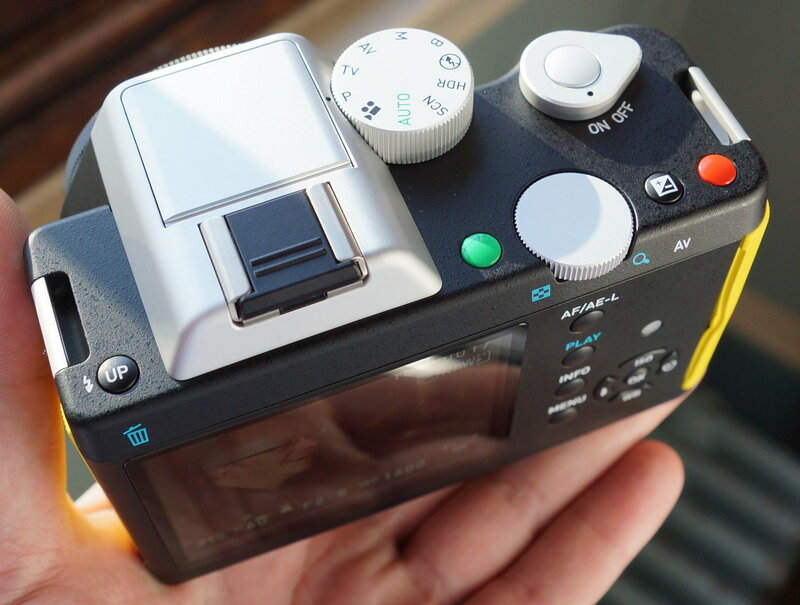 The Pentax K-01 can be held easily with one hand but the position of the mode dial is a little bit of a stretch for your hand. 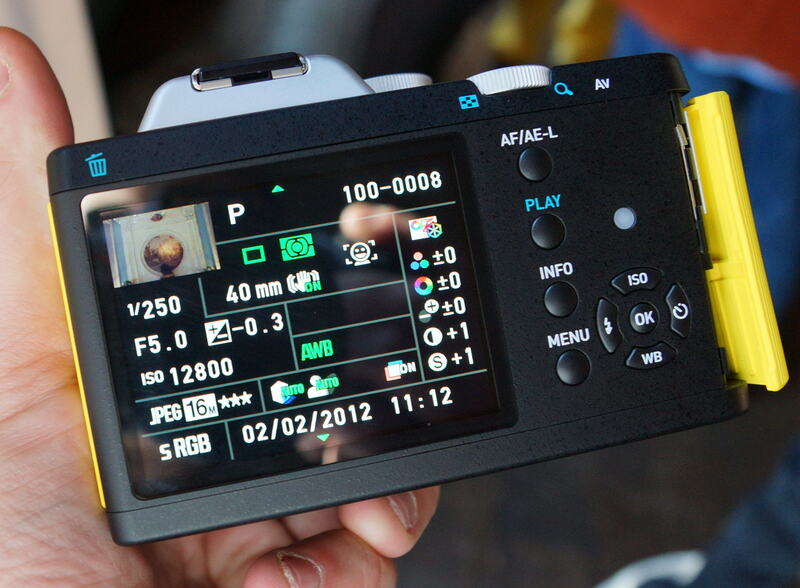 The rest of the controls on the back of the camera can be used easily with one hand and they are clearly labelled. As this is a pre-production model we were not able to take any sample photos, however the results on screen looked good, with good colour, detail, and seemingly low levels of noise, with the camera offering up to ISO12800. When we get a chance to take sample photos with the camera we will post them on the site, in the mean-time have a look at our shots of the camera. A view of just how thin the f/2.8 40mm lens is. The price of £629 body only prices it above entry level Digital SLR cameras, but put it in the middle of the pack with regards to other mirrorless cameras and one would expect the price to drop over time. The Pentax K-01 is a bold new camera from Pentax and is certainly different to anything else made by anyone else - and perhaps that's what Marc Newson and Pentax intended with the design of this new camera. It's also the first mirrorless camera ever to use a full Digital SLR lens mount, supporting existing Digital SLR lenses. This causes the camera size to be larger than most other mirrorless cameras as the distance from the sensor to the lens has to be the same as that of a traditional D/SLR camera. The design of the camera certainly seemed to divide opinion when it was revealed and it would be interesting to hear your feedback on the design. View more hands-on photos below. Interesting! How does the body size compare with a K-X or a K-R? Excellent design, and it opens up possibilities with a vast array of K mount lenses. The battery is the same as the K-5, which is also useful. I'll look forward to handling one of these for real. The design looks refreshingly different and it looks like the ergonomics will make it easy to use in the hand, but why oh why did Pentax not take the opportunity to build in a EVF. The original pictures showing the SLR pentaprism 'Hump' suggested it might have one, but alas no. If you have a camera with only a rear screen for composition at least make it articulated. I hope there will be at least a 'clip on one' EVF like Olympus have for the EP series made available at some time in the future. I don't care what it looks like or who designed it, but that's pretty much K-5 price, so it has disaster written all over it. With no viewfinder option, I don't see why anyone would want one. If you don't like optical viewfinders, why are you going to get a mirrorless that big and chunky? You'd get a NEX or m4/3, right? Why would anyone ever choose this over a K-5? I don't see that the contrast AF with existing lenses can be as good as newer systems designed for CDAF. I don't care what it looks like or who designed it, but that's pretty much K-5 price, so it has disaster written all over it. With no viewfinder option, I don't see why anyone would want one. If you don't like optical viewfinders, why are you going to get a mirrorless that big and chunky? You'd get a NEX or m4/3, right? Why would anyone ever choose this over a K-5? I don't see that the contrast AF with existing lenses can be as good as newer systems designed for CDAF. [quote]Interesting! How does the body size compare with a K-X or a K-R? [/quote] The size is 121 w, 79h, 68d Not sure I'd want to replace a K-x at 122.5w, 91h, 67.5d Or a K- r at 125w, 97h, 68w for one to be honest. Quote:Interesting! How does the body size compare with a K-X or a K-R? Or a K- r at 125w, 97h, 68w for one to be honest. Well I am delighted ... as I want a Mirrorless that will take K lenses. I want APSC. Now I want either an articulated screen or an eve... but that will come with the K-02 ..... but there are many who never use a viewfinder .. so this will be good for newbies and mark 2 will satisfy the rest of us !! Well I am delighted ... as I want a Mirrorless that will take K lenses. I want APSC. Now I want either an articulated screen or an eve... but that will come with the K-02 ..... but there are many who never use a viewfinder .. so this will be good for newbies and mark 2 will satisfy the rest of us !! Is this the replacement for the K-r? If it is it's a disaster. No electronic viewfinder not even a tilt screen. Would be difficult holding it steady, especially with a big lens, zoom or manual lens. Might even have to go to the gym before using it. Glad I got my K-r but if I had the money would get the K-5 over the K-01 - no question about it. Is this the replacement for the K-r? If it is it's a disaster. No electronic viewfinder not even a tilt screen. Would be difficult holding it steady, especially with a big lens, zoom or manual lens. Might even have to go to the gym before using it. Glad I got my K-r but if I had the money would get the K-5 over the K-01 - no question about it. Big bulky buttons, ugly and yellow. Wow. 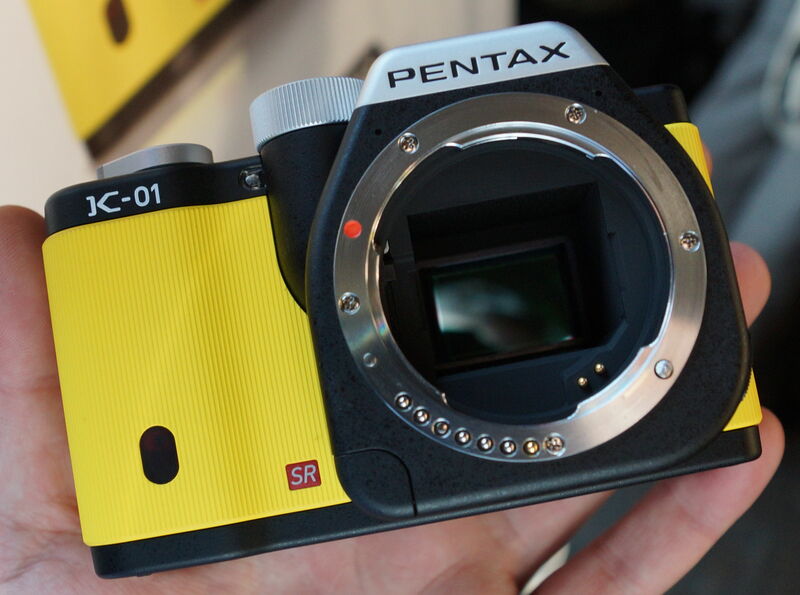 This has to be one if the ugliest cameras of all time. Nice lens, shame about the body really. Might be excellent if your priority is video though ? From the bottom line of photos above, it looks like it's available in black/grey as well as that hideous yellow, so at least that's something. [quote]Looks like an underwater cam........not for me, i'll stick with my M4/3[/quote] ......and I'll stick with my Samsung NXs and pancakes ! ......and I'll stick with my Samsung NXs and pancakes ! Well! how many would still prefer their old Morris Minor? looks like quite a few steps in the right direction. DSLR looking it isn`t but, are they, like the Morris just becoming dinosaurs? I remember donkeys years ago a bunch of folk being let loose on the street with let`s say Kodak Instamatics. (I can`t remember for sure) One guy had stunning results because he had vision, he saw what others didn`t. He saw through the fog of "If it`s not an SLR it`s not a real camera. What the heck was his name? Something Bailey wasn`t it? Or Donovan... hope you see what I`m trying to say. Quote:Well! how many would still prefer their old Morris Minor? looks like quite a few steps in the right direction. DSLR looking it isn`t but, are they, like the Morris just becoming dinosaurs? I remember donkeys years ago a bunch of folk being let loose on the street with let`s say Kodak Instamatics. (I can`t remember for sure) One guy had stunning results because he had vision, he saw what others didn`t. He saw through the fog of "If it`s not an SLR it`s not a real camera. What the heck was his name? Something Bailey wasn`t it? Or Donovan... hope you see what I`m trying to say. I think you're missing the point here. 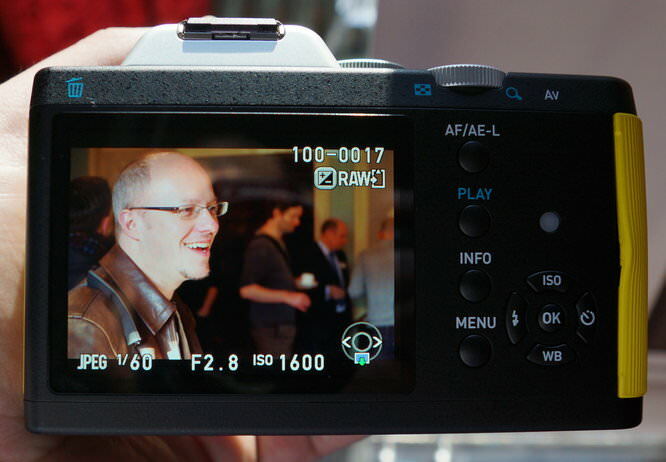 The idea of this sort of camera is that it's smaller than a DSLR and therefore easier to carry around etc. I'm a big fan of Pentax and this camera will produce the goods but why would anyone want a camera that's as I've mentioned above to be about the same size of some the current range of Pentax DSLR's! Why would anyone want to pay this price for a camera that is about the same size as say a Pentax K-X or K-R body that have a proper viewfinder and a built in flash? It does have more MP's than these two cameras but it's not that much smaller than the Pentax K-5 flagship DSLR that has similar MP's! Sorry Ken, gotta fail to agree with you. With respect of course. Why don`t modern cars have starting handles? I have a K5, a K20 and only just passed on a K10 to my daughter. I would want something to complement the K5.The K5 is a staggering bit of kit but I was used to the other two with identical bodies. I had to try the 5 in me hands on several occasions to make up my mind. It is different enough to not be in the same league and I think that the K-01 shows the same and I would gladly trade in the K20 to help fund it. Sorry Ken, gotta fail to agree with you. With respect of course. Why don`t modern cars have starting handles? I have a K5, a K20 and only just passed on a K10 to my daughter. I would want something to complement the K5.The K5 is a staggering bit of kit but I was used to the other two with identical bodies. I had to try the 5 in me hands on several occasions to make up my mind. It is different enough to not be in the same league and I think that the K-01 shows the same and I would gladly trade in the K20 to help fund it. And it looks like it`s made for kids, looks a little fisher priced. [quote]Why don`t modern cars have starting handles? [/quote] Thats what all the RAC & AA mechanics say, When they are called to a flat battery job......:D The point about viewfinders is this, We have an aged Canon Ixus, It is tiny, very tiny, Yet it has a very small optical viewfinder, Right handy for those days when you can't see dam all on the rear screen, Especially when its at arms length from your face.....!!!!!!! The fact that Canon included an optical viewfinder in a very tiny camera, Highlights the fact that the excuse for not including one, Is down to size, That is just rubbish. Its worse rubbish, When some months later they offer add on viewfinders at ridiculous high prices, As if by magic......:D My biggest gripe with this tendancy to remove vital parts, Is the removing of an option to use both rear screen or optical viewfinder ( Even if its an EVF ), Leaving users stuffed with no option. Or ripped off, By having to pay extra for the silly add on items.....:( Even if I was in the market for a camera like this, No optical viewfinder = NO SALE....:P Period....!!!!!!!!!!!!!!!!!!!!!!! Quote:Why don`t modern cars have starting handles? The point about viewfinders is this, We have an aged Canon Ixus, It is tiny, very tiny, Yet it has a very small optical viewfinder, Right handy for those days when you can't see dam all on the rear screen, Especially when its at arms length from your face.....!!!!!!! The fact that Canon included an optical viewfinder in a very tiny camera, Highlights the fact that the excuse for not including one, Is down to size, That is just rubbish. My biggest gripe with this tendancy to remove vital parts, Is the removing of an option to use both rear screen or optical viewfinder ( Even if its an EVF ), Leaving users stuffed with no option. There will be a version of this with an EVF .. ? K-02 but there are many who never use one ... everyone happy. Even though I've owned many Canon cameras, I have always been an admirer and a fan of Pentax. It seems like this unit will be very competitive especially against the likes of the new Sony mirror less units. I was going to buy the K5 recently until I read the Sony A77 review. I will wait until Pentax equips the K5 (under a new name) with a fully articulating display. As for this K01, it would make a difference for a lot of people (we were just discussing this among friends who are serious photographers) if it has a fully articulating display and an EVF with the high resolution like that on the A77. There are those who think an optical viewfinder is the only way to go (like me) until recently when the realization came to me that technology has arrived and getting better such that EVFs are now much more than just practical and acceptable. Nice camera. Way to go Pentax! Even though I've owned many Canon cameras, I have always been an admirer and a fan of Pentax. It seems like this unit will be very competitive especially against the likes of the new Sony mirror less units. I was going to buy the K5 recently until I read the Sony A77 review. 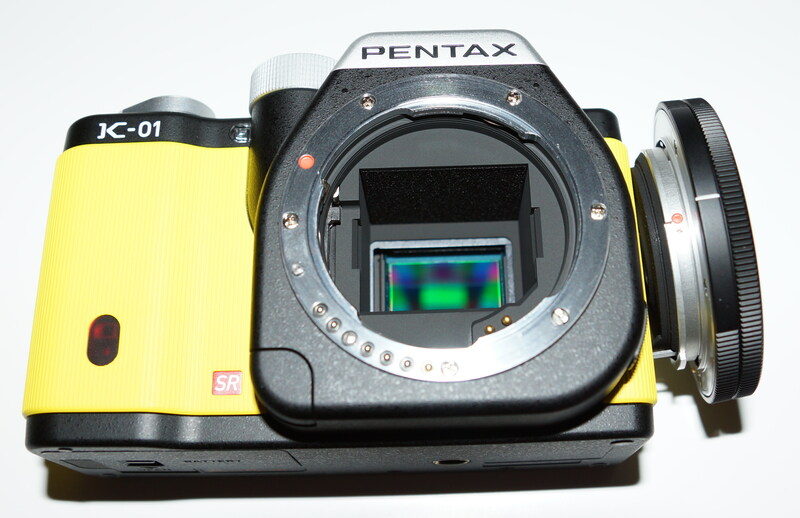 I will wait until Pentax equips the K5 (under a new name) with a fully articulating display. As for this K01, it would make a difference for a lot of people (we were just discussing this among friends who are serious photographers) if it has a fully articulating display and an EVF with the high resolution like that on the A77. There are those who think an optical viewfinder is the only way to go (like me) until recently when the realization came to me that technology has arrived and getting better such that EVFs are now much more than just practical and acceptable. Nice camera. Way to go Pentax!